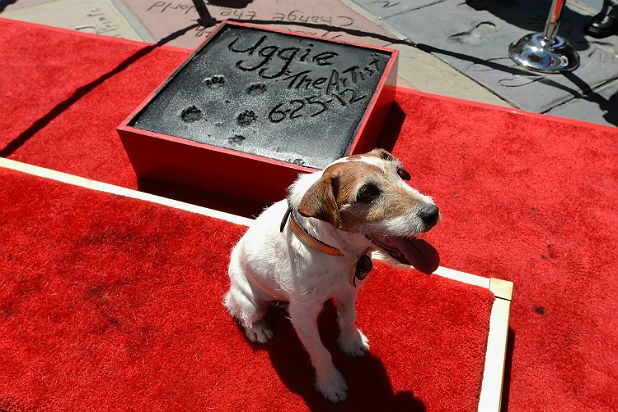 Uggie the dog, who won the hearts of moviegoers for his performance in the 2011 Oscar-winning film “The Artist,” has died. He was 13. The beloved and talented Jack Russell terrier was put to sleep on Friday in Los Angeles after battling prostate cancer. Uggie was most famous for his role in “The Artist,” the silent French comedy-drama starring Jean Dujardin and Bérénice Bejo, which took home five Oscars at the 84th Academy Awards including Best Picture. The canine star had his paw prints immortalized on Hollywood Boulevard in a special ceremony outside Grauman’s Chinese Theatre. He was also spokesdog for PETA in an ad campaign that encouraged potential dog owners to adopt from shelters. Uggie was rejected by two owners and on his way to the pound before animal trainer Omar Von Muller took him in. “He was a crazy, very energetic puppy, and who knows what would have happened to him if he [had] gone to the dog pound. But he was very smart and very willing to work,” the animal trainer said. After retiring from the film industry at age 10, he spent his senior years living with Muller, his family and six other dogs in North Hollywood. Watch Uggie in “The Artist” trailer below.